February marks Teen Dating Violence Awareness Month. 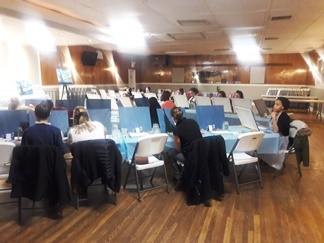 In commemoration of this month, the Katie Brown Educational Program organized a paint night fundraiser on Thursday, February 16th, 2017 at St. Anne’s Fraternity. Led by Eileen Riley of Divinely Inspired Art, participants created their very own renditions of Van Gogh’s famed The Starry Night. Attendees participated in an interactive activity where they read a scenario about a teenage relationship and voted as to whether they thought the relationship was healthy, unhealthy, or abusive. This was a fun way for everyone to get a glimpse of what dating violence can look like in teen relationships, and to discuss the qualities that make a healthy relationship. Proceeds from the event support KBEP so that we can continue to provide our workshops in communities throughout Southeastern Massachusetts and Rhode Island. The Katie Brown Educational Program is a non-profit relationship violence prevention program. Founded in response to the 2001 murder of a young woman by her dating partner, KBEP is committed to teaching young people the skills they need to build and sustain healthy, respectful relationships. Our primary programming is our classroom education that we offer to students in grades 5 through 12. We also offer summer programming for elementary-aged, middle school-aged, and high school-aged children. Other programs that we offer are professional development trainings for teachers and prevention workers, parent workshops, and trainings for college students through the RSVP Program. For more information on the Katie Brown Educational Program, visit our website at www.KBEP.org. Thank you to everyone who attended and supported A Starry Night with KBEP! Preventing violence and promoting respectful relationships is a community effort. We would not be able to do this work without the continued support of community members like YOU! To see more pictures from the event, visit our facebook page here.